Depressed? Feeling Lost/Unmotivated? Don't Believe It! It seems I have started to loose faith in what I am doing, or who I am, after some realities set in. I realized most people are happy and don't need me and my ideas. For those that do, they wouldn't even know my posts/ideas exist, nor would people change their ways even if they know it's the right thing to do. Even when they do, it's very slow progress. So that means I will likely not be able to realize my vision -- everyone is happy. When those realizations set in, I lost my motivation and hence haven't posted for awhile, and started to believe I am just the same old me again -- smart enough to have some ideas but not enough to do anything that have material impact to the world. Once I started that belief, depression kicks in and everything else falls down. I didn't really know why initially, and simply thought it is just life -- sometimes you are up, and sometimes you are down. Earlier this week, while binge watching movies (a thing that I do when I am depressed / in hope of finding some wisdom), one of the movies had me started thinking about belief. And then that thought lead to a question -- why do so many people believe in religion? Then I realized because it provides a sense of purpose, a direction in life -- that means motivation. But I don't think it is religion itself, but simply having beliefs that provide direction and purpose. Without direction/purpose, everything else falls down or stands still: health, family, leadership, fun, and happiness. When I wrote the great leadership and living life to the fullest posts, I had an unconscious belief that provided me with motivation. Once that unconscious belief got crushed by reality, I was lost. Since it was unconscious, I didn't realize the correlation. Believe what you can do. Believe you are the best. Believe you are the smartest. Believe you can remember everything. Progress is change for the better. Believe you are here with a purpose. Without believe, there is no purpose. Without purpose, you are lost. Find your way by believing. With that, I will be updating my posts to place the superpower of belief at the center as I believe it is a core component of life that is the powers everything else. The Unbelievable Power of Belief: Open your mind. 4 Examples of the Power of Beliefs: Pushing your body. 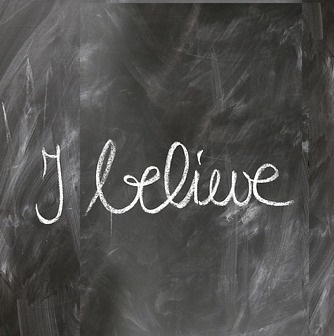 The Power of Believing: Believe and your subconscious mind will make it happen. This is part of the Superpowers blog series.